Nathan Clarke continued his good form from the first team as he led Matlock Town Reserves to the top of the the Central Midlands League South with a 3-1 victory over Welbeck Lions. Academy players Clarke and Ethan Knowles both excelled in Tuesday night’s reserve game against Welbeck Lions after their foray in the Integro League Cup. Their performances dragged a struggling reserve side to a difficult victory, despite missing key players such as Ashton Hall and Jordan Pierrepoint. It only took the Young Gladiators 15 minutes to break the deadlock against a struggling Lions who were on the back foot from the start. A Matlock corner taken by Ethan Knowles found the head of Marcus Beddoe who took his opening chance of the game. It was a deserved lead which saw both Knowles and Sorrell miss chances that could have punished Welbeck further. Unfortunately for Matlock, the first half wasn’t without its blemishes after defender Oakley was lucky to avoid seeing red for a late high challenge. Oakley managed to avoid the book entirely but Matlock couldn’t avoid some late half pressure as two Welbeck free kicks troubled Chesterfield loanee Teddy Marris’ goal. The second half began with both sides feeling the bitter cold; the players using the opening five minutes to warm back up. 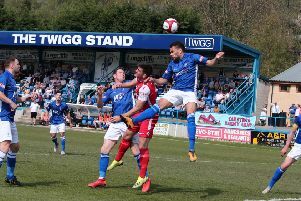 However, Matlock were slow to pick up the pace and were caught sleeping at the back as Welbeck striker Derrick Miller was given too much space on the edge of the box before emphatically finishing in to the bottom right corner. Welbeck conceded a free kick midway through the second half with Scott Welley picking up the first booking of the game. After a thunderous set-piece, the ball rebounded out to Oakley who saw his effort from five yards miraculously saved. The crowd would have to wait till the 71st minute for another chance, a chance which would lead to a goal. Matlock’s best player of the game Ethan Knowles continued to terrorise the Welbeck defence and finally beat his defender for pace. Approaching the by-line, Knowles whipped the ball across the face for Nathan Clarke to slot home. Matlock increased their advantage instantaneously when a Lucas Brough free kick was parried out with Sorrell ready to pounce and convert from close range. Within a matter of minutes, a potentially frustrating night for Matlock was remedied. It was a valiant effort shown by Welbeck but the Young Gladiators continued their charge towards the title.